"This dessert really takes the cake! Two decadent favorites are combined into one! Creamy, delicious, no-bake, vanilla bean cheesecake is made with a shortbread crust. 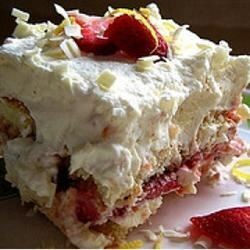 It is then layered with a blend of strawberry puree, fresh strawberries, and shortbread crumbles, and topped off with a rich sour cream and cream cheese vanilla creme. So, you may have your cakes...and eat them, too!" Reserve about 1/2 cup crushed cookies and press remaining into the bottom of a springform pan to create a crust. Blend cream cheese, heavy cream, vanilla bean paste, and 1/2 the confectioners' sugar together in a bowl. Set cheesecake mixture aside. Blend sour cream and remaining confectioners' sugar in a separate bowl and set whipped sour cream aside. Top cookie crust with alternating layers of cheesecake mixture, fruit spread, sliced strawberries, and reserved cookie crumbles. Add whipped sour cream as the final layer. Garnish with any remaining cookie crumbles. Refrigerate until set, at least 4 hours. This strawberry shortcake is a summertime classic. This version ups the ante! Roughly crumble the shortbread cookies by pounding them in a plastic bag.